The International Space Station in 2007. A space station is an artificial structure designed for humans to live in outer space. It is distinguished from other manned spacecraft by its lack of major propulsion or landing capabilities—instead, other vehicles are used to transport crew and cargo to and from the station. So far, only low earth orbit (LEO) stations, also known as orbital stations, have been implemented. These structures have allowed astronauts to live in space for periods of weeks or months, occasionally exceeding a year. The only space station currently in use is the International Space Station, a joint project of several nations. Space stations have been used for both military and civilian purposes. The last military-use space station was Salyut 5, which was used by the Almaz program of the Soviet Union in 1976 and 1977. One of the goals of space stations is to study the effects of long-term space flight on the human body. In addition, they provide platforms for larger numbers and longer durations of scientific studies than available on other space vehicles. Since the ill-fated flight of Soyuz 11 to Salyut 1, all manned spaceflight duration records have been set aboard space stations. The duration record of 437.7 days was set by Valeriy Polyakov aboard Mir, from 1994 to 1995. As of 2006, three astronauts have completed single missions of over a year, all aboard Mir. Broadly speaking, the space stations launched thus far have been of two types; the earlier stations, Salyut and Skylab, have been "monolithic," intended to be constructed and launched in one piece, and then manned by a crew later. As such, they generally contained all their supplies and experimental equipment when launched, and were considered "expended," and then abandoned, when these were used up. Starting with Salyut 6 and Salyut 7, this trend changed; these were built with two docking ports, which allowed a second crew to visit, bringing a new spacecraft (for technical reasons, a Soyuz capsule cannot spend more than a few months in orbit, even powered down, safely) with them. This allowed for a crew to man the station continually. The presence of a second port also allowed Progress supply vehicles to be docked to the station, meaning that fresh supplies could be brought to aid long-duration missions. This concept was expanded on Salyut 7, which "hard docked" with a TKS tug shortly before it was abandoned; this served as a proof-of-concept for the use of modular space stations. The later Salyuts may reasonably be seen as a transition between the two groups. 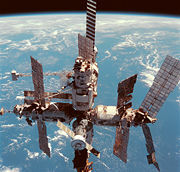 The second group, consisting of Mir and the ISS, have been modular; a core unit was launched, and additional modules, generally with a specific role, were later added to that. On Mir they were usually launched independently, whereas on the ISS, most are brought aboard NASA's shuttle. This method allows for greater flexibility in operation, as well as removing the need for a single, immensely powerful launch vehicle. These stations are also designed from the outset to have their supplies provided by logistical support, which allows for a longer lifetime at the cost of requiring regular support launches. These stations have various issues that limit their long-term habitability, such as very low recycling rates, relatively high radiation levels, and a lack of gravity. Some of these problems cause discomfort and long-term health effects. In the case of solar flares, all current habitats are protected by the Earth's magnetic field, and are below the Van Allen belts. Future space habitats may attempt to address these issues, and are intended for long-term occupation. Some designs might even accommodate large numbers of people, essentially "cities in space," which people would make their homes. No such design has yet been constructed, because even for a small station, the extra equipment is too expensive to place in orbit. Possible ways to deal with these costs would be building large numbers of rockets (economies of scale), reusable rockets, In Situ Resource Utilization, or the hypothetical construction of space elevators. 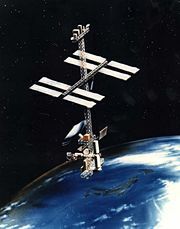 Following the controlled deorbiting of Mir in 2001, the International Space Station became the only space station currently in orbit; it has been continuously manned since October 30, 2000. As of September 9, 2006, it was 44.5 meters (146 ft) in length along the core between the Destiny and Zvezda modules or 52 meters (171 ft) long when a Progress is attached, and has a mass of 183.3 metric tons (202.1 short tons). Crew and visitors counting is non-distinct. **ISS stats as of October 27, 2006. Space Station Freedom Concept (1984). 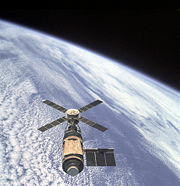 A second Skylab unit (Skylab B) was manufactured, as a backup article; due to the high costs of providing launch vehicles, and a desire by NASA to cease Saturn and Apollo operations in time to prepare for the Space Shuttle coming into service, it was never flown. The hull can now be seen in the National Air and Space Museum, in Washington DC, where it is a popular tourist attraction. A number of additional Salyuts were also produced, as backups or as flight articles that were later canceled. 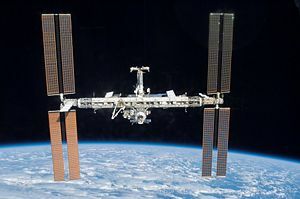 The U.S. Space Station Freedom program, which—despite being under development for ten years—was never launched, evolved into the International Space Station, incorporating elements of the also canceled Russian Mir-2 station, which was never constructed. Other canceled space station programs included the United States Air Force Manned Orbiting Laboratory project, canceled in 1969, about a year before the first planned test flight; this was unusual in being an explicitly military project, as opposed to the Soviet Almaz program, which was heavily intertwined with—and concealed by—the contemporaneous Salyut program. The European Columbus project planned to create a small space station serviced by the Hermes shuttle. It evolved into the ISS Columbus module. Currently, Bigelow Aerospace is commercially developing inflatable habitat modules, derived from the earlier Transhab concept, intended to be used for space station construction and for a space prize they are funding and operating, America's Space Prize. *Genesis-1 is a ⅓-scale unmanned prototype sent up to test the feasibility of inflatable structures and other systems in space. The experimental space habitat prototype Genesis II is planned to be the second subscale pathfinder mission to test and confirm systems to be used in the private company's future full-scale manned modules. Genesis II will be Bigelow Aerospace’s first true commercial flight, carrying items and pictures provided by paying customers. Project 921-2 is the working name given by the People's Republic of China for plans to create a manned space station by 2012. Baker, Philip. 2007. The Story of Manned Space Stations: An Introduction. Springer-Praxis Books in Space Exploration. Berlin: Springer. ISBN 9780387307756. Kitmacher, Gary, ed. 2006. Reference Guide to the International Space Station. Apogee Books Space Series. Washington, DC: U.S. National Aeronautics and Space Administration. ISBN 0971032726. Linenger, Jerry M. 2000. Off the Planet: Surviving Five Perilous Months Aboard the Space Station Mir. New York: McGraw-Hill. ISBN 007136112X. This page was last modified on 14 October 2015, at 16:15.